A shape turn on the west slope of Wolf Creek Pass located about 18 miles east of Pagosa Springs on U.S Highway 160 is one of the more dangerous areas on the mountain pass with a couple hundred foot drop on the other side of the curve. A 30-year-old truck driver from Florida died last weekend after plunging more than 125 feet off Wolf Creek Pass on U.S. Highway 160. Colorado State Patrol Capt. Adrian Driscoll said the truck, a 2010 Volvo semitruck, was headed west toward Pagosa Springs from South Fork. Around 6 p.m. Saturday, the truck failed to negotiate the turn at the scenic overlook at mile marker 160, just before the highway begins a steep descent on the west side of the pass. The truck, traveling too fast, went through the parking lot at the scenic overlook and 125 feet down the cliff, Driscoll said. The driver, identified as Brandon Martinez, was taken by helicopter to a hospital. He died from his injuries around midnight, Driscoll said. “He was driving way too fast,” Driscoll said. The excessive speed caused the brakes to go out, he said. Martinez missed two runaway truck ramps before he went off the cliff, he said. This particular section of the highway is notorious for semitruck crashes, so much so that the Colorado Department of Transportation launched a “Beware the Wolf” campaign to alert drivers of the dangers. Most crashes are the result of truck drivers driving too fast, CDOT has said. 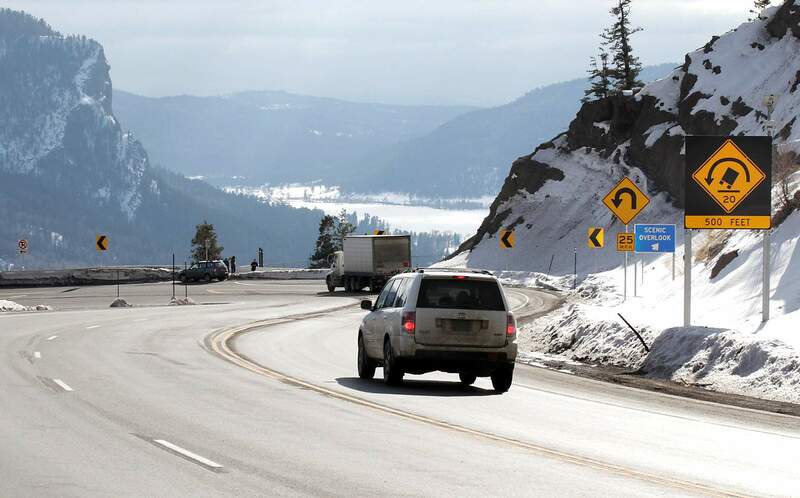 From 2012 to 2016, there were 54 semitruck crashes on the west side of Wolf Creek, from mile marker 159 to 167 (Treasure Falls to the summit of the pass). Two of those crashes were fatal, according to CDOT. This summer, CDOT intends to improve striping, lane configuration, additional signage and construction of a concrete barrier near the scenic overlook. On Monday night, CDOT spokeswoman Lisa Schwantes said there was a report of another semitruck’s brakes going out on the pass. The driver was able to use the last runaway ramp before the highway begins its steep descent with switchbacks.